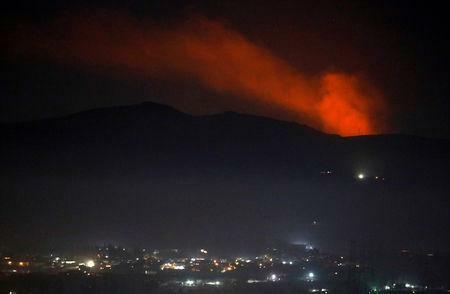 BEIRUT (Reuters) - Israeli war planes attacked with missiles unspecified targets near Damascus, the Syrian capital, on Tuesday and injured three Syrian soldiers, Syrian state media quoted a military source as saying. "Our air defenses confronted hostile missiles launched by Israeli war planes from above the Lebanese territories and downed most of them before reaching their targets," the military source said. Syrian state media reported earlier in the evening downing several "hostile targets" near Damascus. "An IDF aerial defense system activated in response to an anti-aircraft missile launched from Syria," the official Israeli army Twitter account later said. The Syrian Observatory for Human Rights, a U.K.-based war monitor, said Israeli missiles were launched from above the Lebanese territories and targeted western and southwestern Damascus rural areas. "A number of missiles hit arms depots for Hezbollah or Iranian forces," the observatory said. No casualties or losses were reported. During the more than seven-year conflict in neighboring Syria, Israel has grown deeply alarmed by the expanding clout of its arch enemy Iran - a key ally of Syrian President Bashar al-Assad.